Impact Noise – This is the transmission of sound via the connection of different Materials to each other i.e. Footsteps on a floor of a house. What is the difference between sound absorption & sound insulation? There is often confusion between sound insulation and sound absorption. Sound is absorbed when it encounters a material which will convert some or all of it into heat, or which allows it to pass through not to return. For this reason good sound absorbers do not of themselves make good sound insulators. Sound insulators rarely absorb sound. Sound absorbers contribute little to sound insulation. They are treated separately in sound control design. Sound insulation prevents sound from travelling from one place to another, such as between apartments in a building, or to reduce unwanted external noise inside a concert hall. Heavy materials like concrete are the most effective materials for sound insulation – doubling the mass per unit area of a wall will improve its insulation by about 6dB. It is possible to achieve good insulation over most of the audio frequency range with less mass by instead using a double leaf partition (two independent walls separated by an air gap filed with a sound absorber). Flanking noise is more often perceived in flats where noise is transmitted through the fabric of the building. Flanking noise is more often caused by impact noise and often travels through the walls of the building. This is more of a problem if the walls are of a lightweight construction so it is important the correct density blocks are used in the construction of new flats today. Normally a minimum 7 kilonewton density block is specified today to reduce flanking noise nuisance and also help comply with the current regulations for noise control in flats and other multi-occupied buildings. Noise from vibration is often a problem and can be caused by something simple such as a washing machine or a more extreme example such as heavy industrial machinery in a factory. Noise from vibration will generate both flanking noise and airborne noise depending on its location. What is a sound barrier? If you imagine a large stone in the middle of a river, you will see that the water flows quickly around it but leaves a slack area immediately behind the stone. Sound waves act in exactly the same way when presented with a sound barrier that is not complete. Sound damping is normally required to reduce noise from resonating panels. Noise from resonating panels is annoying and addressed by stiffening the panels usually with a vibration damping pad that is glued on. When the rapid variations in pressure occur between about 20 and 20,000 times per second (i.e. at a frequency between 20Hz and 20kHz) sound is potentially audible even though the pressure variation can sometimes be as low as only a few tens of millionths of a Pascal. Movements of the ear drum as small as the diameter of a hydrogen atom can be audible! Louder sounds are caused by greater variation in pressure. A sound wave of one Pascal amplitude, for example, will sound quite loud, provided that most of the acoustic energy is in the mid-frequencies (1kHz – 4kHz) where the human ear is most sensitive. It is commonly accepted that the threshold of human hearing for a 1 kHz sound wave is about 20 micro-Pascals. Eighty-five decibels is the threshold for the possibility of noise-related hearing loss, and this guideline is intended to prevent such hearing loss. This figure suggests that many people who do not currently use ear protection should consider it. The following chart reveals that a great deal of the sound we’re exposed to is above that 85-decibel threshold. Because conditions may vary and distances are not specified, these figures are approximate. Quantities of interest often exhibit such huge ranges of variation that a dB scale is more convenient than a linear scale. For example, sound pressure radiated by a submarine may vary by eight orders of magnitude depending on direction; expression in linear units carries with it the confusion of the location of the decimal point. Decibels values are characteristically between only -999 to +999. The human ear interprets loudness more easily represented with a logarithmic scale than with a linear scale. Amplitude measures how forceful the wave is. It is measured in decibels or dBA of sound pressure. 0 dBA is the softest level that a person can hear. Normal speaking voices are around 65 dBA. A rock concert can be about 120 dBA. Sounds that are 85 dBA or above can permanently damage your ears. The more sound pressure a sound has, the less time it takes to cause damage. For example, a sound at 85 dBA may take as long at 8 hours to cause permanent damage, while a sound at 100 dBA can start damaging hair cells after only 30 minutes of listening. How are decibel sound levels added? If there are two uncorrelated sound sources in a room – for example a radio producing an average sound level of 62.0 dB, and a television producing a sound level of 73.0 dB – then the total decibel sound level is a logarithmic sum i.e. Note: for two different sounds, the combined level cannot be more than 3 dB above the higher of the two sound levels. However, if the sounds are phase related (“correlated”) there can be up to a 6dB increase in SPL. The eardrum is connected by three small jointed bones in the air-filled middle ear to the oval window of the inner ear or cochlea, a fluid- filled spiral shell about one and a half inches in length. Over 10,000 hair cells on the basilar membrane along the cochlea convert minuscule movements to nerve impulses, which are transmitted by the auditory nerve to the hearing centre of the brain. The basilar membrane is wider at its apex than at its base near the oval window; the cochlea tapers towards its apex. Groups of the delicate hair sensors on the membrane, which vary in stiffness along its length, respond to different frequencies transmitted down the spiral. The hair sensors are one of the few cell types in the body which do not regenerate. They can therefore be irreparably damaged by large noise doses. At what level does sound become unsafe? It is strongly recommended that unprotected exposure to sound pressure levels above 100dB is avoided. Hearing protection should be used when exposed to levels above 85dB (about the sound level of a lawn mower when you are pushing it over a grassy surface), and especially when prolonged exposure (more than a fraction of an hour) is expected. Damage to hearing from loud noise is cumulative and is irreversible. Exposure to high noise levels is also one of the main causes of tinnitus. Health hazards also result from extended exposure to vibration. An example is “white finger” disease, which is found amongst workers who frequently use hand-held machinery such as heavy drills or chain saws. It is best to use soundproofing products in these instances. What is the sound absorption coefficient? The absorption coefficient of a material is ideally the fraction of the randomly incident sound power which is absorbed, or otherwise not reflected. It is standard practice to measure the coefficient at the preferred octave frequencies over the range of at least 125Hz – 4kHz. It can be determined on small material samples with an “impedance tube” or on large samples in a laboratory “reverberation room”. 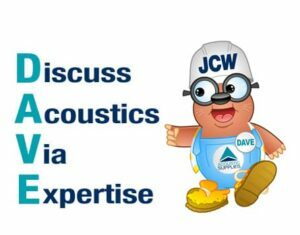 What is sound insulation and how is it measured? Sound insulation is a measure of the sound stopped by a barrier such as a partition wall. We can measure the sound reduction index in a laboratory transmission suite. This consists of two adjacent reverberant rooms, the difference between the level of the sound in the source room and the receiver room is measured, and the properties of the receiver room are taken into account by calculation. The measurement method depends on the particular situation. There are standards for the measurement of the insulation of materials in the laboratory, and for a number of different field circumstances. Usually test procedures generate a loud and consistent broadband spectrum of steady noise on one side of a partition or specimen of the material under test, and then measure the amount of this sound that passes through that material. The ratio of the incident sound to the transmitted sound is the “noise reduction”, usually expressed as 10 times the logarithm of this ratio. If the noise reduction is also corrected for the amount of sound absorption to be found in the receiving room, 10 times the logarithm of the corrected ratio is called the “transmission loss. This is performed for 1/3 octave bands of noise from 100 to 4000 Hz. As you can easily see, if we are trying to make a 30dB improvement, it will not be achieved with egg cartons and vinyl.